Purchase Our Rewards Card Today! Our tummy-friendly meals just became pocket-friendly. 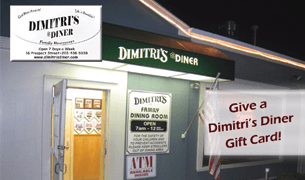 Save big on your meals at Dimitri's Diner by purchasing our reward cards. Buy one for yourself or gift them to your friends or family. Pick your rewards card today! Great spot for families. Staff is super friendly very accommodating. Quick turnaround after you order, good with refills etc. - John B.